A surreal atmosphere courses through the corridors of the Oceanographic Museum of Monaco. Superheroes, princesses and Walt Disney characters interact with the aquariums. 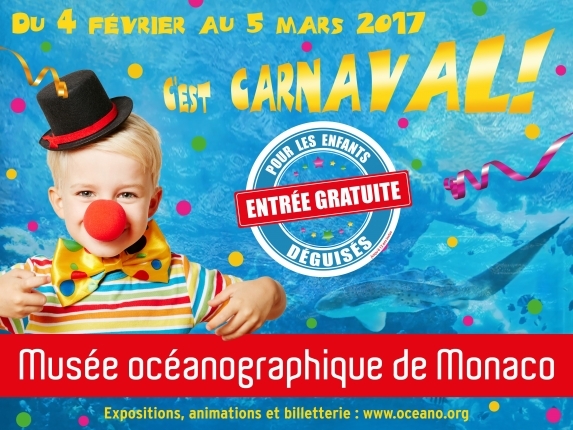 Carnival is not only in Nice! During the school holidays, the museum offers free entry to children in disguise. A way to attract children and involve them in the various activities offered throughout February and early March. Malika is originally from Nice. Visiting with her 3, 5 and 7 year old children, she finds the operation interesting. Romain came with his children, friends and parents. Originally from Nice and Paris, these three families were looking for an activity for the children. The day begins with a fish feeding at 11:15. In front of the museum’s largest aquarium, Florian, a volunteer animator, explains the actions of the aquariologist who throws the food to the animals. More than a simple observation, the activity is playful. The facilitator exchanges conversation with the children, but also with the parents, who are sometimes even more curious than their offspring. During a tactile basin activity, grouped around a small open aquarium, children can touch small sharks or starfish. The questions quickly tumble forward. Finally, immersion with the workshop ImmerSeave 360, a dive (reserved for children over 12 years old) in the waters of Tubbataha, Philippines…or almost. Participants are invited to put on a virtual reality helmet to see the ocean as if they were there. Carnival, until the 5th of March. Tactilebasin: 6 euros per child. ImmerSeave360: 8 euros per person.